-Walter is struggling to tell Peter the truth about where Peter really comes from. -Olivia knows the truth as well but also has not told Peter. -Walter thinks a letter will do it. 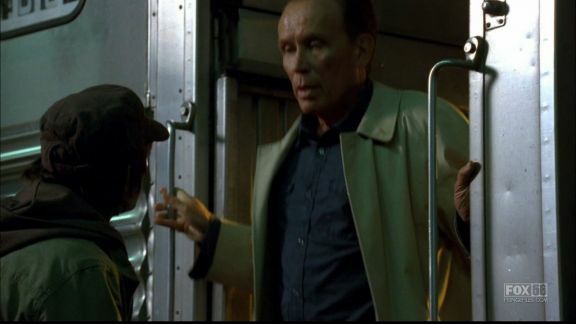 -Alistair Peck appears on a train, killing everything in it. -He discovered how to bend time so he can go back to save his fiancé. -He hasn’t figured out how to go back to that day though, leaving innocent people dead. -Because of his limited time jumps he comes back to the train, starting the day over for the team and they don’t remember. -Walter, understanding Peck’s motive, becomes an ambassador trying to talk Peck out of jumping back that far to save his fiancé because he will never be able to live with the consequences. -Walter is hoping for a sign of forgiveness from God. He thinks if God forgives him, so will Peter. -Peck still jumps back to that day but instead of saving his fiancé he dies with her. -The day begins anew with Walter writing a letter. If you are still not sure what this episode was about you can read it here. 2.17 White Tulip is a special case. It started with Walter writing a letter to Peter, trying to explain why Walter kept the secret from Peter that he is from the other universe. It ended that way as well which means the only one remembering that case is Alistair Peck. The case in a sense never really happened for the team. Peter in S4 is the only one remembering everyone and all the cases. Later in S4 Olivia is regaining our Olivia’s memories but I’m not counting it because they were “cortexiphan-enduced”. I still haven’t figured out how exactly she remembered all the stuff but it seems those memories only served the purpose for her to activate her abilities through cortexiphan to be able to collapse the two universes. 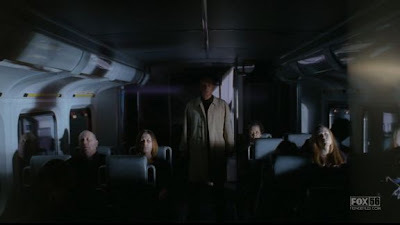 As Peck appears on the train, the energy dispersed kills everyone. 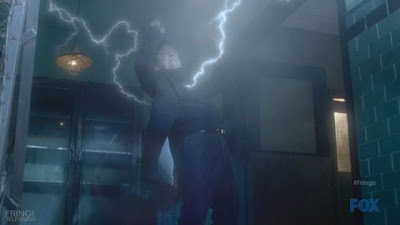 Olivia was asked to do a test by David Robert Jones, to turn lights on in 4.14 The End Of All Things and as she does she dispersed a lot of energy, killing Leland. Later in 4.22 Brave New World Part 2 she gets angry at Jessica Holt because Jessica is not saying where Bell is. Olivia touching Jessica, disperses energy and unintentionally kills Jessica. As Olivia and Peter escape in 4.14 The End Of All Things, Olivia’s nervous system does a trick on her and she has a seizure. Bell said in 4.22 Brave New World Part 2 that Olivia is the energy source that will be able to collapse the two universes. She is the living uncertainty engine. If just a small amount of energy released in Peck’s time jumps killed that many people, would – if Olivia had collapsed the universes – she have died because of the amount of energy she would have had to use to finish? Would others have as well? So then, Walter actually saved her life by killing her. And of course the regenerative ability of Cortexiphan helped, phew! 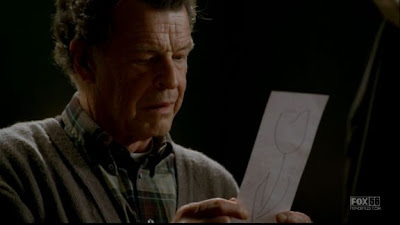 In 2.17 White Tulip Walter avoids Peter because of this secret Walter kept from Peter. The dynamic between Peter and the Walter from the new timeline is similar. 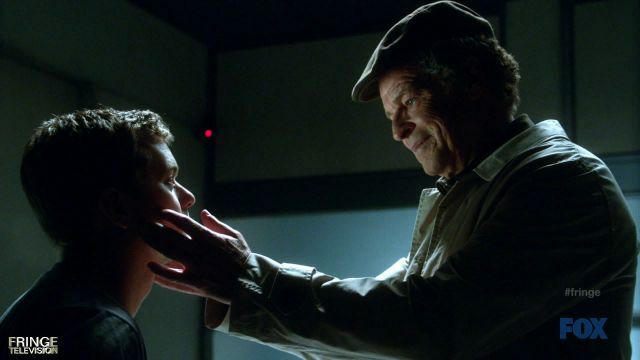 In S4 or at least for the first half of it, Walter is struggling to accept that this is his adult son from another timeline. Walter doesn't want anything to do with him. He can’t even look him in the eyes. The example here is 4.08 Back To Where You've Never Been. The formulas and equations written on Peck’s wall. Peck says he has read Walter, knowing what he is all about. Walter says he grasps some of equations. Walter: "If I comprehend this correctly, then this Alistair Peck has taken Einstein's Theory of Relativity and turned it on its ear. I grasp portions of it, Tachyons are depicted here, but I fail to see their relevance. However, it does confirm that Doctor Peck was dealing with tremendous energy to do... whatever it is he's doing." 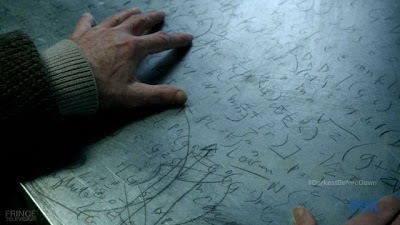 I thought of the formula on the table in Walter’s cell in 4.21 Brave New World Part 1.
and of Bell in 4.22 Brave New World P2 disappearing for sure was similar. Does this mean anything? Or is it really just coincidence? Where did Bell go? Did he go back in time or just to the other universe, since they didn't collapse? Throughout 2.17 White Tulip, tremendous energy is being released. S4 came down to Olivia being the ultimate Power source. 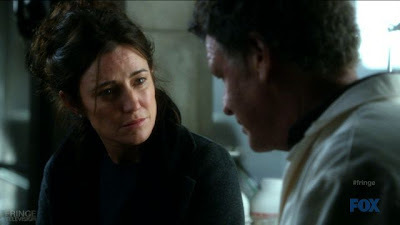 In retrospect, did she have something to do with Peter appearing in form of energy in 4.04, 'Subject 9'? She asked that question herself in the beginning of that episode. This Olivia also had Cortexiphan in her from when she was a child and who knows how long Alt-Nina had been given her new injections. Just because we only saw it happening in 4.07 Wallflower doesn’t mean it just started then. And the people on the train in 2.17 White Tulip did. And yes Walter was probably talking about Peter since Walter's Peter died and the one from the other universe. 2.17 White Tulip. Peter: “Déjà vu. Fate’s way of telling you that you're exactly where you're suppose to be... you’re right in line with your own destiny.” Peter doesn’t believe in it. Olivia experienced it in 2.17 White Tulip, feeling like she’s been in Peck’s apartment before. After she “unlocked” the other Olivia’s memories in S4 did it feel like déjà vu for her? Did it feel like déjà vu for Peter in S4 reliving some of the cases they had worked on before? 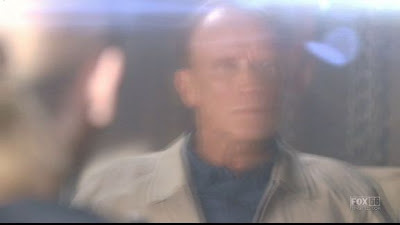 Peck had Faraday mesh implanted in his body to create a temporal time pocket. 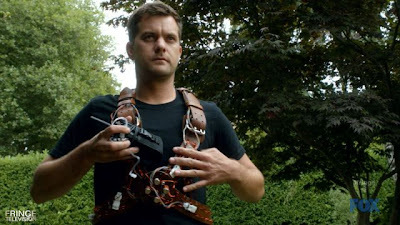 Walter built a Faraday harness for Peter in order to step through the time pocket in 4.06 And Those We've Left Behind. Einstein’s theory on travelling faster than the speed of time. Is this what the Observer’s use to travel seemingly back and forth? 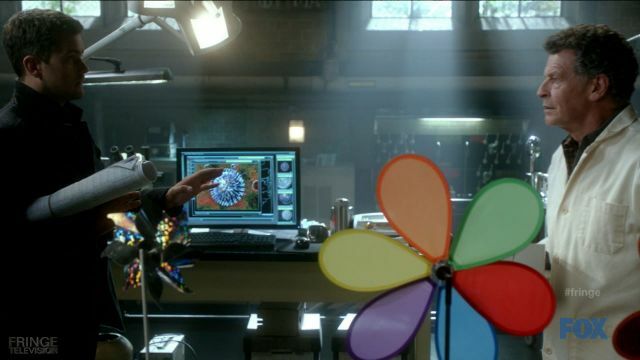 Jessica Holt said in 4.22 Brave New World Part 2 that their method really is just tech that lets them do this? The consequences of trying to right a wrong. 4.13, 'A Better Human Being' comes to mind again: “the hubris of improving on God” is stuck in my head as I think of this. Walter wasn't talking about the consequences Peck referred to: the people dying in the process. Walter was talking about taking Peter from the other side and bringing him over. He had to live with this knowledge and kept it from Peter. Through unforeseen circumstances Peter found out on his own (2.18, 'The Man From The Other Side'). I think the burden of taking Peter is not Walter's only struggle but also that he never told him. Walter had crossed the line. For the sake of one life he destroyed two worlds. 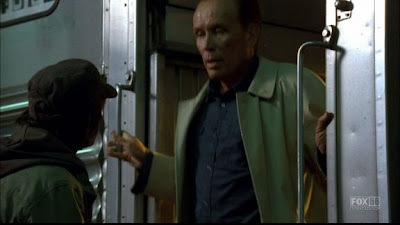 I recall a conversation Walter had with Peter on their way to a case in 3.09 Marionette. Olivia had just returned from the other side. Walter is encouraging Peter to tell her the truth about the other Olivia. In the car Walter said to Peter: "You understand better than most the pain a lie can inflict." In 3.15, 'Subject 13' we saw that Peter somehow knew he didn't belong. At the end of that episode Peter accepted his situation. We also know that Walter did something so Peter later wouldn't remember. What would have happened if Walter would have allowed Peter to remember where he came from? Would Peter have accepted it? Granted none of us had to face what Walter did but have you ever done a "wrong" and lived with it and all seemed fine and then later gone back to set things right? What was your outcome? What consequences did you encounter by trying to right that wrong? In S4's timeline both Peters' died. This is an even bigger burden to carry for Walter I think. Walter still crossed over to save Peter, the vial still broke and the Observer was not there to rescue both Walter and Peter. And then seeing the adult version of his son, Walter struggles even more because he sees it as punishment from God like "see I told you not to mess with it. 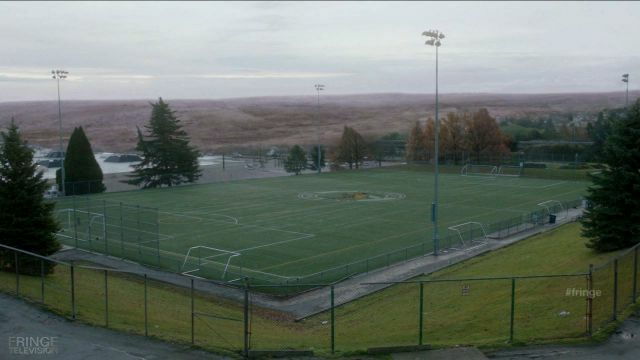 This is what you could have had." He even blamed Nina that Peter died because of the vial breaking (4.05, ' Novation'). And Walter had accepted that he deserved to be punished. Walter asking for a sign from God – the white tulip. I was reminded of the conversation Walter had with Elizabeth in 4.09,' Enemy Of My Enemy' as she came to visit him in the lab. Walter had shared that he has been punished by God. That he had asked for a sign of forgiveness but didn't receive anything, that there is no absolution for him. Did this Walter also ask for a white tulip or was it something different? Elizabeth tells him that she had forgiven him, a long time ago. 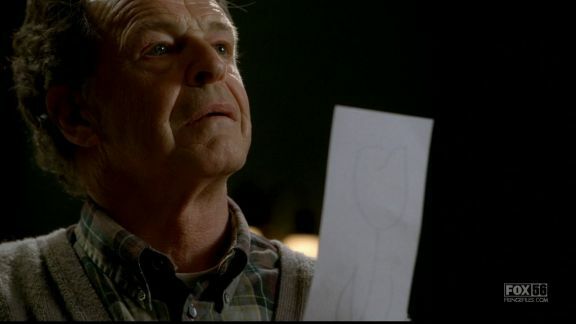 Was this the "white tulip" for this Walter that made him decide to help Peter get back home? Or was it the picture Elizabeth painted of what Peter's life would look like if he were "home"? Later in 4.22 Brave New World Part 2, Bell paints a different picture of Walter. 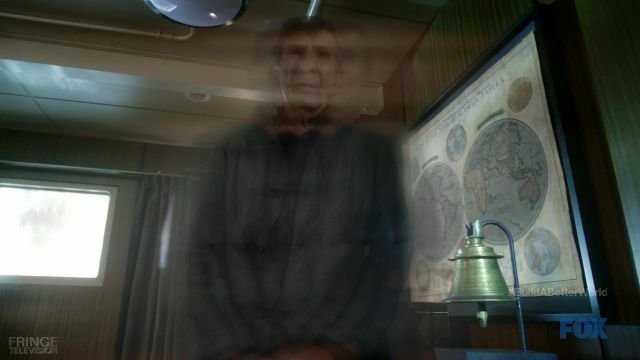 Bell said that Walter hated God, because both Peters' died. It was too much pain so Walter decided to "play" god and create his own universe, running by his rules. For one I don't see any benefits for Walter do so. Two, I don't believe Bell. And Three I still can see how this Walter changed for the better. Just like we saw our Walter change for the better in the old timeline. I recall Olivia telling Peter in 2.10 Grey Matters: "From what I know of your father, going crazy made him a better person. It certainly made him a better father." Someone forgot to mention that to David Robert Jones and William Bell. Something I noticed only after I don’t know how many re-watches, lol: Before every jump, Peck put his coat back on. Hm. When Peck appeared on May 18th, running through the field, the area around the balloon was decimated. It reminded me of 4.12 Welcome to Westfield when Phase 2 started to destroy everything. Maybe I’m reading too much into this but it felt like there was a point made by focusing on Arlette’s engagement ring. Reminded me of 4.01 Walter finding the engagement ring on the victim’s finger. WALTER: "Engagement ring. I don't think there's anything sadder than when two people are meant to be together and something intervenes." We know that Olivia and Peter are destined to be together but how many times have they been torn apart. Has “fate” intervened for them, to always find their way back together? Will it continue for them or will it…? In 4.10 Forced Perspective Olivia asks Broyles if he believes in fate. He doesn't. Neither did Olivia until she investigated a case where victim's deaths are predicted and before, September told Olivia in every future she had to die. Earlier we said that deja vu is fate's way of telling you that you are where you're supposed to be... in line with your own destiny. Can fate be manipulated? I have a plaque in my Fringe Case that says: Destiny is not a matter of chance. It's a matter of choice. It seems that quite a few of those who ever studied or taught at MIT have gone mad. Walter was a Harvard educated post-grad at Oxford and MIT (1.01 The Pilot), Peck taught Astrophysics (2.17 White Tulip) and Neil Chung taught Math (4.11 Making Angels). Peck used Einstein's Theory to be able to travel through time. Neil Chung theorized with his equations that once solved, space and time could be flattened, so they would all be on a level plane, in essence being able to see past, present and future simultaneously. Of course Neil also had the Observer's device that helped a bit. Does that mean if the Observer doesn't have that, he can't see the future? Was that why September didn't know where Walter was in 4.22 Brave New World Part 2? 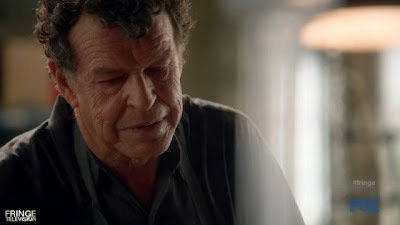 I always liked this line from 4.11 Making Angels as well: "And like most mathematicians, he [Neil] believed that math was the key to unlocking the secrets of the universe." I know it's not S4 but I just watched 3.06 6599 kHz where Walter theorized the First People's code was the key to the universe. How many cases in Fringe dealt with someone doing something out of love for someone else? Too many to count. But the outcome was pretty much the same - the results were negative. Peck tried to go back in time to change the outcome of the day his fiance died. As he jumps through time, innocent people die and Peck himself. 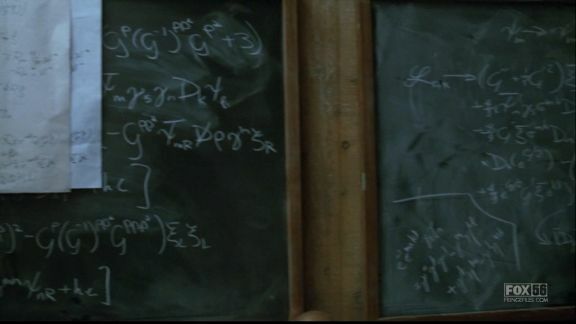 In 4.06 And Those We've Left Behind Raymond Green used his wife's equation to create time chambers. His wife had Alzheimer's and with the machine he always went back to before she got sick to complete the equation in order to keep that chamber open permanently. Innocent people died. 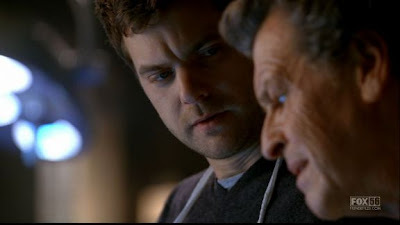 In 4.13 A Better Human Being Dr. Owen Frank wanted to improve the DNA of his kids but in the end his kids killed him. In 4.18 The Consultant Fauxlivia finds out that Alt-Broyles is the mole. 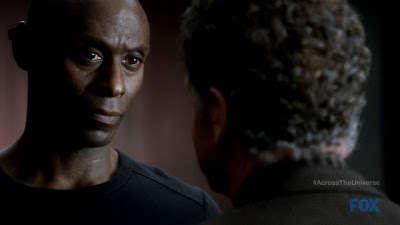 Alt-Broyles basically was blackmailed by David Robert Jones. DRJ had a cure for Christopher, Alt- Broyles's son. In exchange DRJ wanted Alt-Broyles to attach a device to the machine to destroy it. During one of the scenes in 4.18 The Consultant, Alt-Broyles has a conversation with Walter. WALTER: "None of what Jones is doing would be possible without the right conditions. I created those conditions by crossing over all those years ago. Had I not done that, we wouldn't be in this situation now." COLONEL BROYLES: "Doctor Bishop. May I ask you something? If you had to do it all over again, would you make the same choice?" WALTER: "If you'd asked me that question a few months ago, the answer would have been no. But now that I have met my adult son, got to know him, I don't know that I'd do anything differently." Alt-Broyles was willing to destroy a universe for the sake of his son. Sounds familiar, doesn't it? 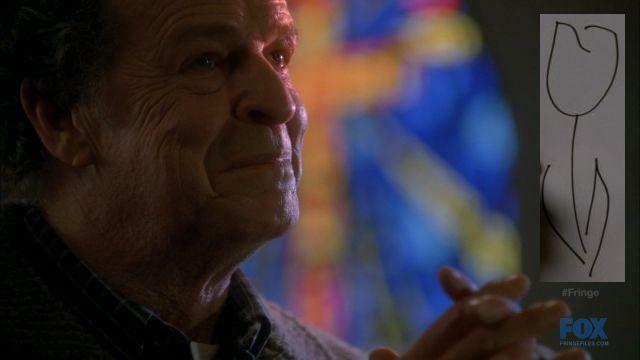 At the end of 4.18 The Consultant Walter encourages Fauxlivia not to judge Alt-Broyles because he acted out of love. Throughout all seasons of Fringe this has been a theme: "How far would you go for someone you love." I think unless we've been in a situation like this, we don't know the answer. At the end of 2.17 White Tulip Walter gets mail. The white tulip. He had shared with Peck that this is the sign from God he is waiting for. Peck instructed Carol Bryce at MIT to sent this off on a certain date. Walter doesn't remember the conversation with Peck though and thus believes it to be a true sign of forgiveness from God. WALTER: "...And I was so grateful. Since then, in moments of deep despair, I have found solace in believing that you had forgiven me. I was willing to let him go. I was willing to let Peter die. I've changed. That should matter. God, I know my crimes are unforgiveable. So punish me. Do what you want to me. But I beg you, spare our world." 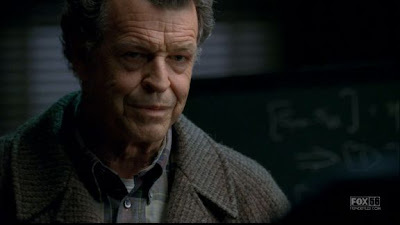 If I may: Fringe is science. But if you are at the end of the rope scientifically, one of your other option is religion. One statement Walter makes that I disagree with - I believe that there IS always forgiveness. Fringe is about relationships, not only between Olivia and Peter but maybe even more so between a father and his son. Fringe is about different choices and changes. And Fringe is about two universes. What implication (if any) will 2.17 White Tulip have for the end of the series? Will S5 end somehow the same way it ended for Peck? In order to set things right Peck traveled back in time and sacrificed himself. Will someone sacrifice him/herself in order to set things right? Will someone die to set things right? Will someone disappear to the point of no return in order to set things right? Will someone go back in time to set things right? WALTER: Then allow me to serve as a precautionary tale. There will be repercussions if you pull Arlette from that car. You don't know how things will be changed by your actions, but they will. It's not our place to adjust the universe. And you will never be able to look at her again without knowing that, just like every time I look at my son. I have traveled through madness to figure this out. And you will too. 'White Tulip' is the essence of the series. It asks you to think about how far you would go to save someone you lost, and the consequences of that. Would you travel back in time to change an event if you could? Would you forgive yourself for the fallout from that action? Would God forgive you? 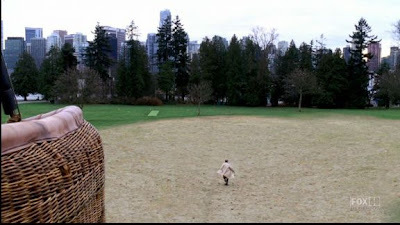 Think of the Fringe series as a seesaw. Seasons 1 and 2 are one side and Seasons 3, 4, and 5 are the other. 'White Tulip' is the fulcrum. Every episode is effected and influenced by 'White Tulip.' Heady stuff, I know, but it's true. And I love that the episode itself isn't told in a straight line. The episode itself contains the changes it discusses and their consequences. 'White Tulip' is a work of art and executive producer Joel Wyman, who co-wrote it, should be very proud of it. It really should have received an Emmy. Silvetta, I'm not sure which part you are referring to as the error. I said that Walter does NOT accept Peter. Can you explain. Any chance of putting in a 'Read More' in these reviews? Thanks. @cortexifan=The mistake is to say that Walter does not accept Peter as a son, while Walter knew that Peter was his son, told him clearly, but Walter said he did not deserve to be part of the life of Peter. That's it.